My husband works hard and we only get one weeks holiday a year as a family. This year we made the trip across the Tasman to Tasmania. It’s the middle of winter so it was freezing. Tasmania is known for it’s fresh produce, great wine and cheeses and wilderness filled with the most amazing flora and fauna. Here are a few snaps from our journey across the ‘Apple Isle’. The quilts of Deloraine. Made over 3 years using silk and other textiles. These panels were hand embroidered and appliquéd. 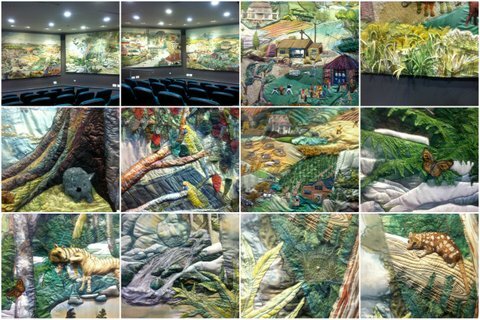 quilts staged in these beautiful backdrops. we honeymooned in Tassie 27 years ago and we visited most of those places you pictured. Lovely to see them! We will get back there one day. Love the quilt pics. The photos are beautiful. It was really fun to see another area of the world. Stunning! Thanks for sharing such wonderful pictures. Looks like you enjoyed your holiday. 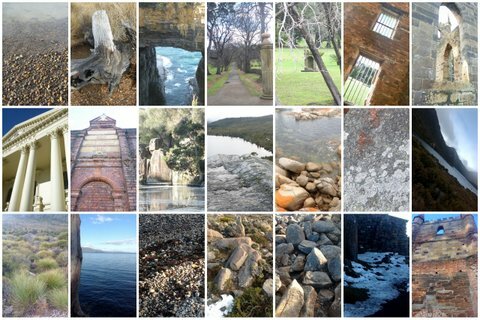 I would love to visit Australia some day – thanks for the beautiful pictures! Gorgeous pictures! I would love to visit one day. Ah, all the more incentive for me to visit again soon. Great photos! That beautiful photos! thanks for taking us along with you. Gorgeous scenery. Looks like a wonderful holiday!